If one boat could fully encapsulate the fabled allure and spirit of Saint-Tropez it has to be Manitou. This 62-ft cutter rigged Marconi yawl may be difficult to differentiate from the other 113 beautiful and historic Tradition yachts lining the wharf at Les Voiles de Saint-Tropez. Like so many others, she sports a pristine white hull, teak deck, brass fittings and immaculately varnished spars. What sets her apart from her fellow competitors in the Rolex Trophy fleet and draws the crowds is her association with the 35th President of the United States, John F. Kennedy. While her prestigious former owner may never have raced her, Manitouwas today lined up on the start line for the third race of Les Voiles and the Rolex Trophy. 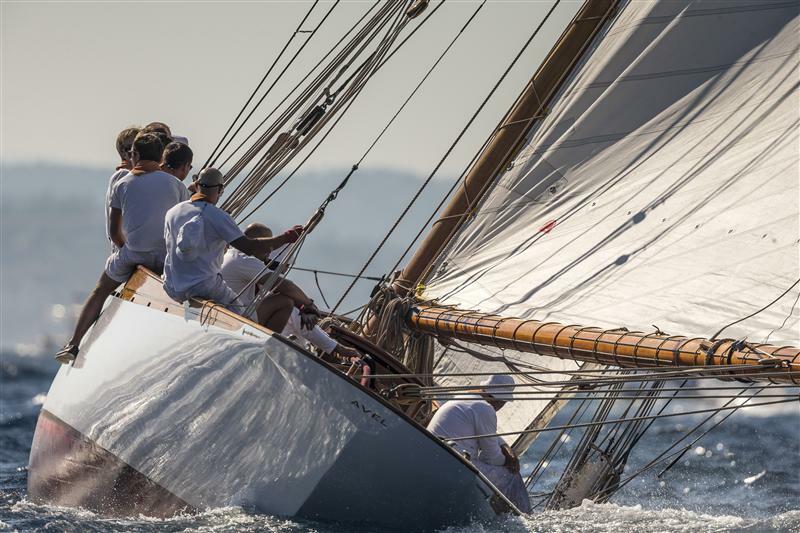 The 14 nautical mile course sent the Tradition yachts north-east out of the Bay of Saint-Tropez, before a leg south, and the westward return home. For the main part, the race was conducted in a wide-ranging 5 to 15 knots of easterly breeze, which swung a dramatic180 degrees towards the end of the race. Manitou has long been a valued yacht. In 1936, American James Lowe commissioned Olin Stephens to design him a boat that could win the 289nm Chicago-Mackinac Race. Launched in 1937, Manitou more than fulfilled her owner’s ambitions breaking the elapsed time record and winning the 1938 race on corrected time too. Nilsson and his fellow owners may take great credit for having restored the racing pedigree of a fine yacht. Some of the most memorable photographs of JFK on the water were taken onboard Manitou and the yacht was known as the ‘floating white house’. That Greek shipping magnate Aristotle Onassis tried to buy her while courting Jackie Kennedy, former First Lady of the United States, only adds to the lustre of Manitou’s story. All told her credentials surely give Manitou the right to an exulted place within the exclusive legend of Les Voiles de Saint-Tropez. Tomorrow marks the fourth and final race for the Rolex Trophy awarded to the best performing yacht over 16m on deck in the Tradition division at Les Voiles de Saint-Tropez.